Ryanair, Europe’s No. 1 airline, today (11 Dec) revealed it will carry over 10 million customers this Christmas (between December 11th and January 8th) breaking last year’s record Christmas traffic by 5%. Saturday, 22nd December, is set to be the airline’s busiest day of the festive season with almost 400,000 customers travelling on nearly 2,100 flights, while the last flight on Christmas Eve will land at 17:55hrs, with no flights on Christmas Day (the only day in the calendar when Ryanair does not fly), before services resume on 26th December. Ryanair confirmed that its most popular ‘flying home for Christmas’ routes include Bulgaria, Lithuania, Poland, Romania and Slovakia, while record numbers will jet off to the Canary Islands for Christmas in the sun, with Austria, Italy and Switzerland ski routes also booking fast for both Christmas and New Year. 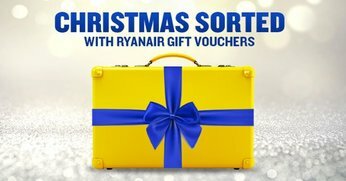 And Ryanair urged those who’ve yet to purchase gifts to pick up a Ryanair Christmas Voucher, which are now on sale on the Ryanair.com website, allowing customers to give their loved ones the gift of travel and the choice over of over 220 Ryanair destinations.